TOWSON, MD – Porter-Cable launches a corded ¼-inch hex compact impact driver, model PCE201, with performance, ergonomics, and durability features aimed at professional uses. The 3.25-lb. PCE201 impact driver is small enough to use overhead or horizontally. Professional-friendly features include an electric brake, ¼-inch hex chuck and external brushes for easy servicing. The electric brake provides control and helps to prevent the common problem of overdriving fasteners. The ¼-inch hex quick-change chuck allows for quick accessory changes and versatility of the tool with the ability to use multiple bits. The PCE201 impact driver features an ergonomic handle' and its belt hook can be attached on either side, depending on the preference of the user. “Users have expressed satisfaction with the performance of their cordless impact drivers,” said Mike Peiffer, product manager for Porter-Cable, but "complain that they must constantly re-charge their batteries." The PCE201 provides the performance of cordless impacts but increases productivity since it requires no re-charging time. Its 4.3-amp motor operates at 3,500 beats per minute. Its metal gear housing dissipates heat build up caused by the impacting mechanism, allowing for durability during heavy-duty applications, says Porter-Cable. It delivers 1,450 inch-pounds of max torque, useful in a wide range of fastening tasks. It features a variable speed trigger and reversing unit, and provides up to 2,900 rpm for control and fast speed of application. 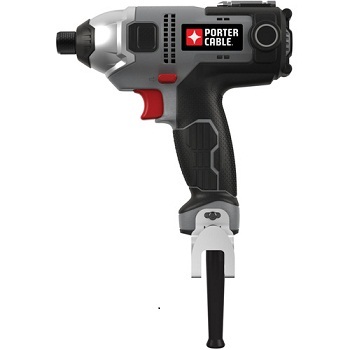 The Porter-Cable impact driver PCE201 retails at $89.97.